My card base measures 6-1/2 inches wide by 5-1/4 inches tall. The bottom of each layer is cut using Spellbinders A2 Bracket Borders One. I used Bracket Border on my card base, my cream layer and my design paper layer that is matted with the same shape in lavender paper. Then over top of everything I used Spellbinders Romantic Agenda as a belly band – it’s backed with the same lavender paper. I didn’t want to cover that beauty up so I tucked a small multiloop bow underneath it. Stay warm friends! It’s even below freezing where I live so I know it’s cold up north! Isn’t it a perfect day for drinking hot chocolate, throwing on your thick wool socks, snagging your favorite blankie and crafting the day away? Make it so! Thanks for stopping by, and I’ll see you soon. A truly beautiful, elegant card. I certainly agree about the pearls. Be still my heart, this absolutely gorgeous Becca, love the design the colors and verse (nothing like Quitefire) . You do amazing work and always have. Just keep on designing and I’ll keep on coming back. WOW! 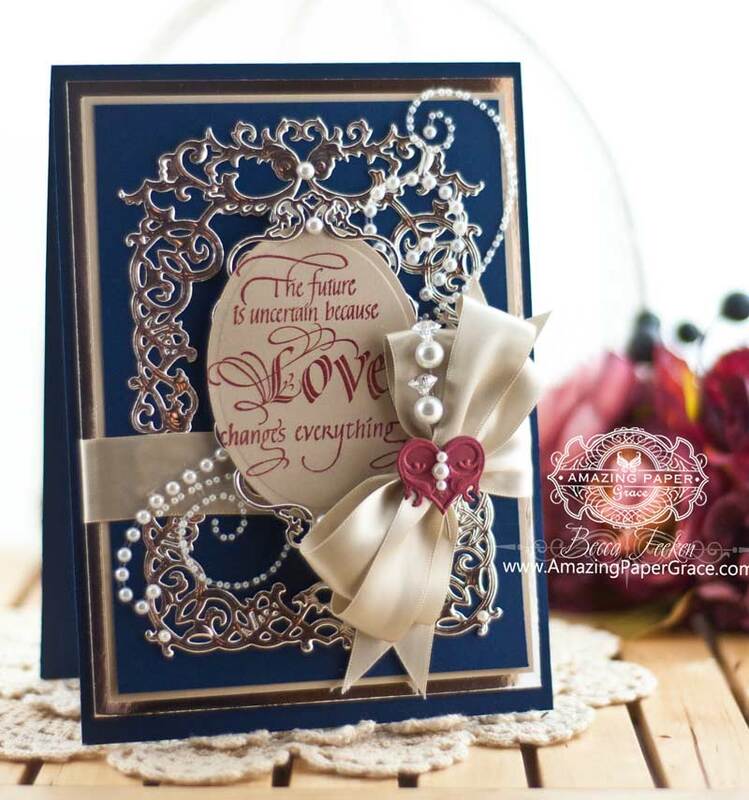 Love this stunning card and I love these two new dies Oval Regalia and Romantic Agenda, I hope its not too long before they are available in the UK. The papers you have used are so pretty and I love your pearl beaded embellishment on the front. The sentiment is perfect as always. What a beautiful card and love those dies., you always know what to put together.You are right its darn cold and no sign of it getting any warmer I am tired of winter, so will stay in and make cards, you keep warm. Hi Becca, I’m in AWE, your card is so beautiful and elegant. Please tell me, the RIBBON is 1/4″ or 1/2″. And the DP, which one is it?. And where did you get those gorgeous PEARL BUTTONS? I am looking all over the internet and I cant find anything like it. Thank you for sharing your talent and for your inspiration. Love these new Dies and I NEED them all as usual! …..crafting is so obsessive lol! 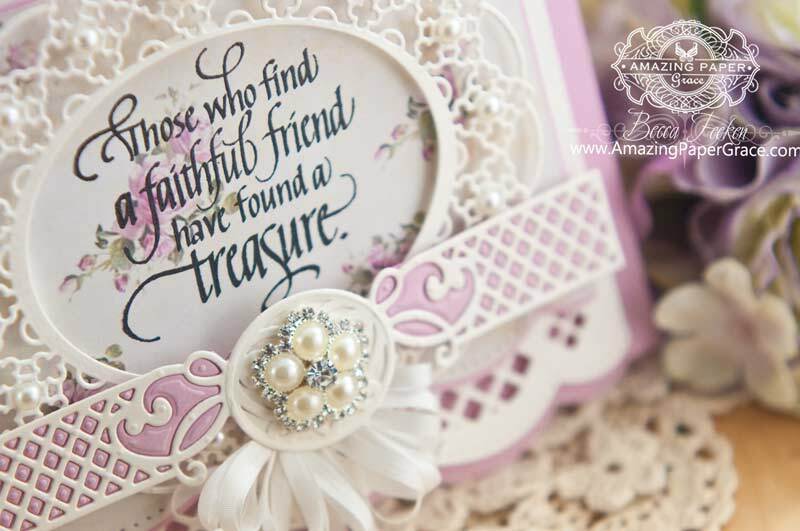 This is such a pretty card and yes the pearls do make a difference! Quietfire always seem to have the right words! “A child of God,” you definitely are and HE has blessed you with “amazing” talents. This card is one of your many masterpieces. I know I have to have these 3 sets of dies so guess I will fall off the wagon – my friends are threatening to send me to “Spellbinds Anonymous!” lol When you see something like this how can you help but buy more. Another absolutely gorgeous card! 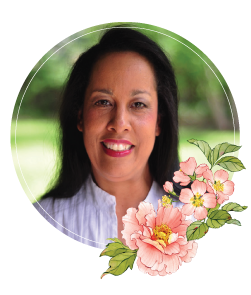 Do you have a video that shows how to put the lavender behind the cream in the belly band? This is just beautiful – as always. Becca, you know how some art pieces make you go “Wow!” And some make your heart resonate? This card did both for me…just outstanding. My question: on the belly band, my assumption is that you ran the die through with lavender paper with an embossing pad? I’m curious about the myriad of small, perfectly placed dots…did you do those by hand? The result is stunning…however that came into being. Another beautiful , feminine card. I love everything about it. I’m also curious about how you achieved the purple diamond effect behind belly band (I’m assuming you dry embossed it). Also, the rose paper you use, would you share your source? I know you use a lot of digital papers. Thank you for sharing your God-given talent with all of us. I’m at awe…Simply stunning is all I can say. I love how you share your tools so we can play along with you. Spellbinders here I come. A really beautiful card and a lovely , true sentiment to go with it! the sentiment says it all!! paired with ur talent and use of dies this card is extraordinary. thanks for sharing with us. Morning Becca and all crafters, oh wow what gorgeous cards you have put on over the past few entries, sorry I haven’t been able to comment on them but have been unwell, I am loving all that you do. Becca you are amazing. This is such a gorgeous card and I love the way you have combined the two colours in the belly band. Such patience. Wow! Your cards are just awesome! Beautiful! Love your colors, layers and all the elements! You are awesome! So lovely! A perfect card for those of us born in June – Roses & Pearls. I love it. You got my day off to a beautiful start – Thank you, Becca! Becca, I love that saying. The card you made is perfect. I just found your blog and believe it or not, I have gone through all of your posts. And I loved them all. Your work has inspired me to be more creative and think outside the box. Your talent is amazing and thank you for sharing. Also I’ve found new companies to look for, some things I have never seen before. Such a beautiful and delicate card today and such a very true sentiment too, quite simply I love everything about this one.